Look! Can you believe it? Speculoos, the delicious Belgian kind made by Lotus now available at your local Fred Meyer (Kroger.) 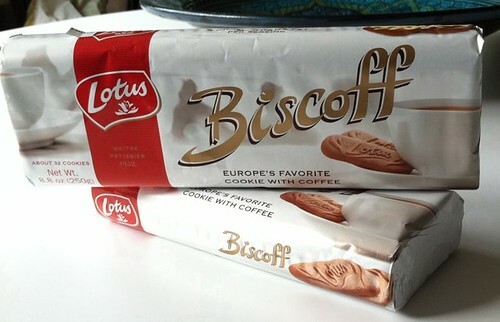 I wonder why it is being marketed as Biscoff instead of Speculoos? Hmmm. Biscoff is just as strange to an American as Speculoos is. Maybe it is a combination of biscotti and coffee. Marketing geniuses explain yourself! Seeing it kinda makes me sad. It makes me afraid that places will lose their individuality, their uniqueness. Everything is available everywhere. I like the idea of certain products only being available in certain places. I don't want to buy African imports in Northgate mall or Italian pottery at Pacific Place. Ugh. I know it is inevitable as the world gets smaller. But I don't have to like it. And I don't. Hmph. I hate to even say this but next to the Speculoos was Speculoos cream for sale! Packaged as Biscoff spread. Trader Joe's even sells their own version of it called Cookie Butter. Not a very appetizing name if you ask me. 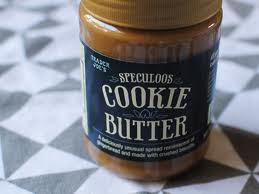 I happened to notice the Cookie Butter is a product from The Netherlands. I bet it tastes just like the real thing. Jennifer, thanks for sending me a jar of Speculoos cream. It made my day! Unfortunately I can just go down to the crummy Fred Meyer and buy a jar myself. I know what you mean about being disappointed to see certain things Stateside. One summer, though, I actually bought Polish pottery at TJ Maxx...for prices that beat those at the factory in Poland! Of course, the selection at TJ Maxx was limited and quite poor. I think I've seen those called Biscoff in Europe. I can't be sure. I keep my eyes open & be sure to report any sightings! Wow, you're kidding! Now that you have a jar of the real stuff you'll have to do a blind taste test. It could be very different: you know how different American Nutella is from the real stuff. Let me know how it turns out. I feel the same way you do, but usually in the reverse when I see Subway in Europe or other American chains restaurants. Doesn't the world have enough chain restaurants? Our local grocery store sells those cookies too, but I was at first confused by their name because they are nothing like Italien Biscotti! Hey there Katy! Your speculoos posts intrigued me last year (something new for me). However I did come across and buy some yummy looking biscuits last year called Biscoff (as they were sold in BULK at Costco for a while! )so I guess it turns out I have had it! At the time I couldn't pinpoint the flavor but thought they vaguely reminded me of an (elegant) ginger snap! Funny thing!...Your reference to being able to get it at 'the crummy Fred Meyer' makes me smile. I'm with you. I feel the same way when I see things I thought were unique to somewhere else. It makes them feel less special!